Discussion in 'The Tanks of World War 2' started by WO_Kelly, Nov 10, 2006. Or, Kelly, by using mortar rounds. High trajectory and a low velocity which fits your calculations perfectly. I agree Fivetide. In simple terms (for I am a simple person...no comments :wink: ) the more force you can put into a thinner thing the more chance of penetration. I have drawn up something to help explain. Will edit this when I upload it. Number one is a shell that is perpendicular to the armour at the time of impact. the horizontal distance (the funky thing under the armour line) is exactly 5 pixels wide. 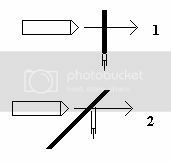 Number Two is the same situation (ie, identical velocity) except the angle on impact is now 45 degrees. the horizontal distance is 6 pixels. If you want I can e-mail you the image itself. Basically, the total distance the shell has to penetrate is in a straight line through the armour, thus the highest potential for a 'sucessful' hit with penetration will only occure whe the AoI is exactly 90 degree to the slop of the armour. I have no idea who this helps more.....whatever. If we are talking about artillery and mortars, I completely agree with his statement. However if we are referring to tank shells at regular combat ranges, then the statement is incorrect. Arty shells could neglect the angle of armor, but they are shot from a long ways away, and mortars are simply fired at high angles. Again, I am working on digging up info, but trust me when I say shells don't change angle that much. The German Mark 4 series with the short barrel 75 L/24 only dropped 5 degrees at 2000 meters, and considering the dispersion on that gun, chances are it wouldn't hit anything anyways. Considering this gun was one of the lower velocity guns of WWII, you can bet the shells don't angle a lot. Yes, shells can drop several feet over over a few hundred feet, but they don't re angle themselves. Actually the States test fired the first aimed artillery shell a while ago...same tech can and probably will be applied to future tank ammunition. But that's beside the point isn't it? Okay someone on the WWIIOL forums was nice enough to post this. I have no interest in doing those calculations, but a general rule of thumb is that what ever angle the gun is elevated at, that is the angle the shell will hit the ground at. If you look at the 6 pounder, its barrel was only raised 5 degrees to go 3000ms. To neglect an angle of 30 degrees means you would have to raise the barrel 30 degrees or so for the shell to come in at that angle. ... provided both tanks were on a perfectly flat surface. Although unless the terrain was very disturbed it would not make much of a difference. THough we will never know I wonder what the percentage of "first hits", actually knocked out a MBT. I can understand the first tank to be targeted say in a ambush to be high, but during a large Tank battle ? True, but 3000m was a pretty impractical range to shoot at an enemy. Probably the best thing is just to figure that unless on a hill, there is little chance of sloped armor being neglected bu the way a shell falls. Ordinarily the slope multiplier would be about 2.5 for 60 degree slope, giving about 112mm effective resistance. I noticed, regarding the armor improvement in the M4A3 series in 1943, the change in the front hull of earlier marks with a thicker but less sloped plate the armor quality is given as the reason for the improvement in protection. This doesn't recognize the major improvement in design. Armor quality of the earlier M4, M4A1, M4A2 may not have been as bad as has been suggested. The M4A3 front hull armor revision reduced the vulnerability of the front plate by eliminating the near vertical armor over the bow machine gunner and driver positions. Only the hull MG remained a weak point and the transmission armor remained unchanged. Considering how much of the area of the front glacis of the basic M4 design was near vertical the change in design of the M4A3 should have improved the tanks protection alone.